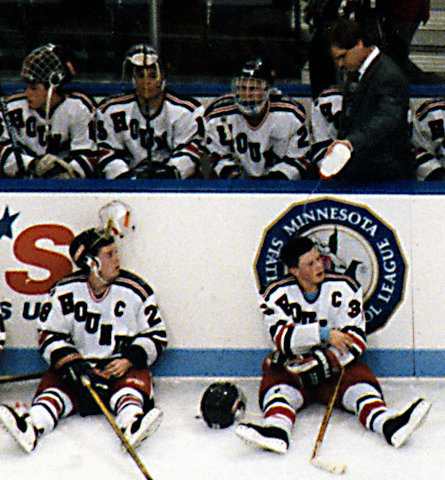 Duluth East coach Mike Randolph gets creative with a water bottle as Greyhounds star Chris Locker, left, and Dave Spehar take a break during the epic five-overtime 1996 semifinal against Apple Valley. Tonight's Duluth East/Minnetonka championship showdown has alumni of both programs taking notice and doing their part to rally the current troops. Dave Spehar, 1995 state champion with an electrifying three hat tricks in as many games: "Soak it in ... Get it done ... 218 grit. GO HOUNDS!" Spehar attended the Greyhounds' skate Saturday morning. Asked the location, Spehar wittily replied, "Area 51." Chris Locker, 1995 champion whose passes were the catapult that launched so many Spehar goals: "You all have been dreaming and talking about this moment. Every sprint, every bag skate, every summer workout has been all put forth to get here. You boys have earned the opportunity to play for a state championship. Take it all in. Enjoy every second of it, Leave it all on the rink. Play Hound hockey for 51 minutes. Bring it home boys." Nick Angell, member of the last Duluth East championship team in 1998: "20 years is enough. It's time for the team of '98 to pass the torch. Good luck tonight. Go Hounds!" Meanwhile, former Minnetonka standouts sent their Twitter love. Star Tribune Metro Player of the Year in 2008 and current Toronto Maple Leaf Jake Gardiner: @Jgardiner272: Watching @TonkaBoysPuck in the state tourney up here in Toronto. Good luck boys!